Gables Whistler: 1-3 Bedroom Townhome Listings - View details for each Gables rental home, then simply book direct from the listing details page for an instantly confirmed Gables Whistler reservation. You pay less & get more personal service by booking direct with a Gables owner or local Gables Whistler manager because you skip middle agents. Alternatively, get a complete Gables Whistler analysis, including location, what's nearby and pros & cons! PREMIUM LOCATION: 2 min walk to up/down load ALL lifts on BOTH mountains all seasons. Adjacent to Village. Quiet; private; spacious; full kitchen; free parking and wireless; laundry. Secure bike storage. Backs onto park. THE GABLES, SUPERIOR SLOPESIDE LOCATION. Private,quiet townhome in parklike setting, 5 min. walk to lifts & village, free parking & free wifi, full kitchen, fireplace, Jacuzzi tub, insuite laundry, ski storage and a large outdoor deck. PREMIUM LOCATION: 5 min walk to up/down load ALL lifts on BOTH mountains all seasons. Adjacent to Village. Quiet; private; spacious; full kitchen; free parking and wireless; laundry. Secure bike storage. Backs onto park. Quiet two bedroom, 1.5 bath townhome with log cabin feel. Prime location next to Fitzsimmons Creek, two minutes flat walk to ski lift and not much further to village center. Excellent location! 2 level upper townhome in The Gables. Mountain style rustic fireplace, and comfortably furnished for no fuss living with the amenities of home. Welcome! 3 Bedroom condo, wood burning fireplace, jacuzzi tub, best location, furnished in pine with high vaulted ceilings. 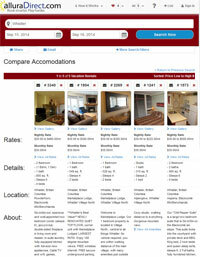 Accommodation in Whistler by Development - see all Whistler developments. Search all Whistler Accommodations - With over 550+ top-located Whistler vacation rentals, you'll find what you want in less than 2 minutes. Whistler BC Trip Planning & Deals -Visit our Whistler homepage for trip planning resources, weather forecasts & huge direct booking deals on lift tickets, activities and more. Gables Whistler Homeowners - List your Gables Rental! Self-manage your Gables Whistler vacation rental yourself, irrespective of where you live. Dump expensive commissions and take control of your Gables property in 0-5 minutes per day, irrespective of what time zone, country, state or province you live in! Learn more about how to take control of your Gables Whistler vacation home or contact us to learn more. Own Vacation Rentals other Destinations? It's fun, safe and easy.